We have been to this hotel several times and always find it basic but clean and not too far up the hill! We return to it happily but would say it is a bit of a climb for people who are elderly or unfit.I would agree that the 24 hour adult channel is a concern for people with children as it is freely available and cannot be blocked. where basic but more than adequate.the apartments where also ideally located only 5 mins from the main shopping centre,and a taxi only cost 2.50 euros back up the hill. the staff where very friendly and always ready to help with any problems.the pool was a fine size and the terrace got the sun all day i would also like to give a special mention to drac daisy bev and sue who run the poolside bar nicer people you could not meet also many thanks to roger who cooked up two brilliant bbqs he served up a feast. we would go back in a minute.my only concern would be the 24hr adult channel which is on normal tv a problem for families with children. so enjoy your stay if you go. When we arrived it seemed ok, but after a few days we wanted to go home the rooms were scruffy and the sheets looked like they hadnt been washed for a month, we has problems with ants and the electricity kept cutting out when in the shower or if we turned the cooker on, it was unclean didnt dare eat off the plates. 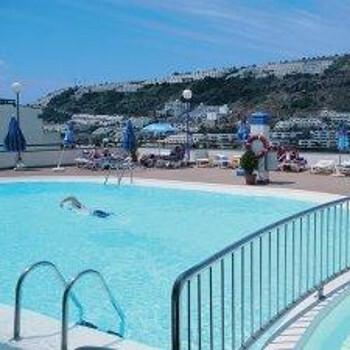 It is quite far up the hill so wouldnt reccommend to elderly people but i suppose its ok for a cheap holiday definatly wouldnt go back though. There was harly ever staff around but when there was they were nice. The pool bar is very dis-organised they didnt have any food to cook for us so we ate out in the day. Puerto rico is great though recommend this resort to anyone!! I stayed in this hotel for 2 weeks in september 2003 and it was fantastic,immaculate,the staff were friendly and it was a joy to stay there. I stayed on my own but my family were in apartments elsewhere in the resort but they spent most of their time with me round the pool.The pool was a decent size for the number of apartments.Perfectly located away from the noise of the pubs and clubs.All in all,10 out of 10. The hotel was exactly what I paid for. A cheap good value holiday. The location was ideal and the staff were friendly. It was a no frills hol at a no frills price. I work as a travel agent myself, I thought the Carlota Apartments were excellent. Our room was clean, nice size and had massive balconys, and had amazing views of Puerto Rico. The apartment has 24hours security which was good. The hotel staff were friendly,helpful and also chatting and laughing. The location was good, but there were a few steps from the centre to the accommodation but nothing to drastic. I would recommend this hotel to all my customers wanting to travel to Puerto Rico. Over all I give the Carlota Apts 5 stars.